In afternoon at around 4.30 PM when the picnickers were having their meal suddenly the volume of the river got rise. 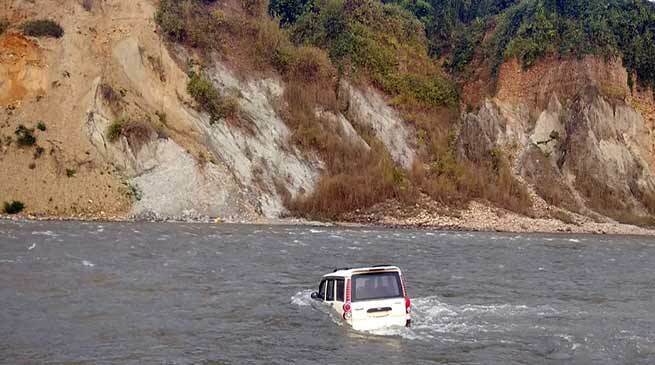 A school bus and a Scorpio swept away in Pare river on Friday afternoon in Doimukh circle of Papum Pare district while 25 picnickers saved themselves. Doimukh Police Station OC Banghang Tanzang when contacted inform that a team of teaching faculty and few students of Queen Public School, Lekhi was on a picnic trip today in Doimukh circle on the bank of river pare. The picnickers cross the river early in morning and continue their picnic on the other side of the Pare river. On Friday at around 4.30 PM when the picnickers were having their meal suddenly the volume of the river got rise and a huge volume of river water inundated whole area including the river bank, The huge volume of river water submerged the school bus and a Scorpio and washed away. However all teachers and students are stated to be safe. They save themselves. Since it got dark and due to flow of huge volume of water investigation was delayed and no FIR have been received. Tanzang said. Further investigation would be done early morning. OC added. However, a sources inform that the picnickers narrowly saved themselves when they see that the volume of the river water was increasing abruptly while they were continuing their meal. All picnickers are save but could not save their belonging which were kept on the bank of river and in the vehicle. The sources added. We always heard about Some incident that Pare river is danger then why The students and Teachers are organising the Picnic there ? ?